On our Twitter account (@3ptproductions), we post a #TuesdayTip relevant to the sports marketing and production industry. Our goal is to share best practices with game directors, producers and stage managers across the country. 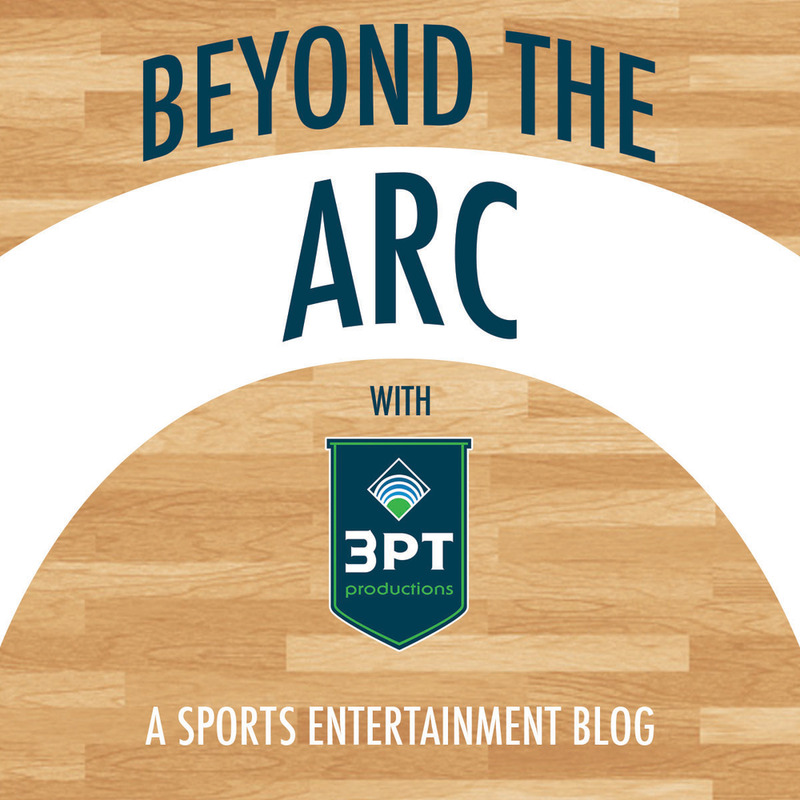 At 3 Point Productions (3PT), we believe that a primary cause of decreased attendance at sporting events, especially in collegiate sports, is due to a declining focus on the in-game fan experience. If you're serving up PA reads over graphic screens or commercials during your pre-game, timeouts, quarter breaks or at halftime, then what makes your event unique from the at-home experience? People attending your games should be rewarded with an entertainment value that the fans watching at home don't experience. Creatively weave sponsors into your game presentation by building elements that engage fans and add entertainment value to your fan experience. Great stage managers, like our own Todd Albright, have the ability to proactively address presentation challenges and make the appropriate adjustments without distracting or disrupting the crowd's attention. A good presentation should steer the crowd's attention like a spotlight. A good stage manager should be working in the shadows of the spotlight, out of the camera shot, ensuring the presentation moves along flawlessly. The way you choose to present your brand will steer fan perception. In the photo above, Oklahoma is displaying a National Championship trophy with the Championship Gymnastics team sitting on two undressed tables. This photo was used in a promotional social media post. By dressing up the presentation of the trophy and team, the overall perception of the event will be enhanced. Your presentation can steer fan perception and often time the solution is simple, like adding branded table-skirts or a back-drop. A very important habit to form for new Game Directors is to develop consistent count in and count out cues when producing a game. It's especially important when transitions include audio and video elements. A solid countdown should provide the cue needed for operators to smoothly transition between elements, avoiding turbulent or abrupt audio transitions which may unnecessarily jolt fans and spectators. #TuesdayTip When at a conference, break out of your comfort zone. Sit front row for panels. Initiate conversation with people of interest. If you find yourself attending a conference in the near future, try using this tip. I've personally made this a practice for every conference I attend and it has resulted in getting more engaged in the conversation topics, asking more questions and making stronger connections with people of interest. Networking works in mysterious ways. Go make an effort to meet the people that interest you and engage them in conversation. Afterward, you'll most likely feel inspired, gain some knowledge or best practices you can apply to your work and add another connection to your growing network. Audio should be an area of focus when producing any gameday experience. When directing a full season, work with your DJ to create a playbook that you can use to talk through and build late-game scenarios including music bumps, crowd hypes and other situational audio prompts. A cheat sheet allows the director and the DJ to work together to build inventory for every scenario imaginable. Our history with the Seattle Storm dates back to the team's inception in 2000. Since then, the WNBA has generally shied away from Kiss Cams. They simply chose to avoid the issues that could arise among families in reaction to the LGBT fan's public display of affection. We decided that as part of the Storm's Pride Week Celebration that we wanted to try a more modest approach, the Love Cam. After all, it's 2014 and we're in Seattle - one of the country's most progressive cities in terms of gay rights and activism. We figured with a Love Cam we could encourage all acts of affection between any amount of people. We didn't take camera shots of wild or drunk fans. We took camera shots of kids with their grandparents where hugs were shared. We took camera shots of lesbian couples and let them enjoy a kiss in front of thousands - just like every Kiss Cam you've ever seen with straight people. The element ran perfectly and the feedback and love we got for the Love Cam (like the story linked in the tweet above) was incredible. The success of the idea was based on a calculated risk. We took the risk, formed a plan and executed it professionally. The result reminded us why we do what we do here at 3 Point Productions - Turn moments into memories.